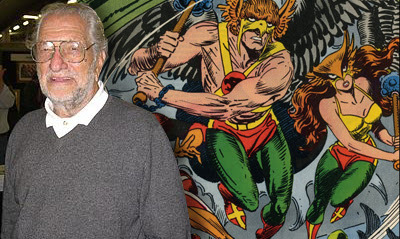 Joe Kubert, a legendary name from within the comics field has passed away. Not only was he an incredible talent in terms of his work on titles such as Sgt Rock, Hawkman and more, outside of the comics industry Joe also created another astonishing legacy in New Jersey's The Kubert School. A learning facility dedicated to helping the next generations of artists find their feet and one I myself even once applied to. 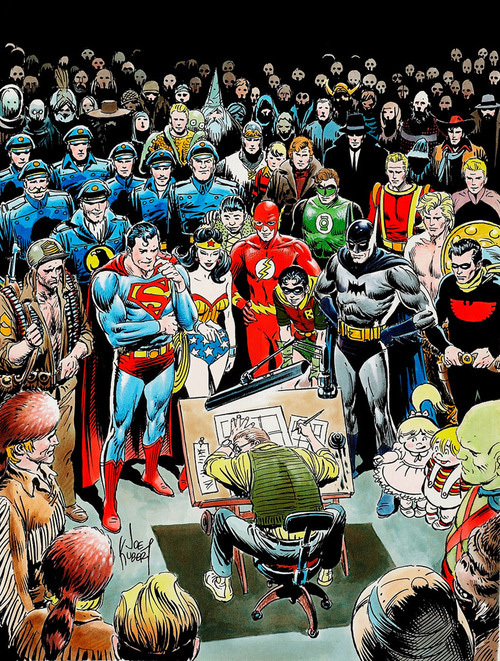 Thoughts at this time go out to all Joe's friends and family, including Adam and Andy Kubert, two individually iconic artists in their own right, and the best legacy of all to come from one of the brightest and biggest icons there ever was. Labels: In Memorial, Joe Kubert, R.I.P. Just saw this, and was like, "How sad." I know Kubert was old, but it seemed like he'd go on forever, like Stan Lee has. Damn shame, but he left behind a huge legacy, in both his artwork, the shhool, and his kids of course. I know Dale - his impact on war comics alone is massive, let alone all the generations of artists he taught composition and camera angles and other skills too. Damn - first Giraud and now Kubert. Seems the great masters of old are falling one by one. Must admit I never saw much of his stuff - are there any collections you guys can recommend? Depends what you like Pensol. War stories his work on Sgt Rock is a must have, even in the recent Wednesday Comics DC put out a few years back. Me, I'm a huge Hawkman fan, and his work there (which should be collected at an Amazon.com near you) was one of the first books where detail and fluid motion that I trademark his style with really came to life, and stood out on the racks. Kubert died Aug. 12 in Morristown, N.J. of multiple myeloma, according to the New York Times. He was 85. Kubert was born to a Jewish family in southeast Poland, and immigrated to New York as a baby. He started drawing comics at an early age, and began working for DC Comics in the 1940s. At the end of his life, he continued to draw in the hospital despite his illness. Kubert is best known for his work on the DC Comics characters Sgt. Rock and Hawkman. He was inducted into the Harvey Awards’ Jack Kirby Hall of Fame in 1997 and the Will Eisner Comic Book Hall of Fame in 1998. Kubert also worked on a number of Jewish projects, including “Cartoonists Against the Holocaust” for the David S. Wyman Institute for Holocaust Studies, a traveling exhibit of 1940s political cartoons from American newspapers about the Jews in Nazi Europe, and a two-page adventure comic with moral lessons called “The Adventures of Yaakov and Isaac” for the Lubavitch magazine Moshiach Times, the Jewish Daily Forward reported. He is also known as one of the leaders of the Wyman Institute’s unsuccessful campaign to persuade the Auschwitz State Museum in Poland to return eight paintings belonging to Dina Babbitt, a fellow cartoonist and illustrator. He started a petition that gathered more than 450 signatures of comic book creators from around the world and international attention for her cause. Thanks for that Dave - wow - so much more actions to appreciate him for. I just remembered another title he did I forgot to mention that I loved reading Challengers of the Unknown. That was some great work too. What a great legacy.